Dashcam Viewer v2.5.2 was released today with the following new features and bug fixes. Added Italian language translation. Special thanks to John Westman for providing the translation. Added Hungarian language translation. Special thanks to Rebi Rebell for providing the translation. Fixed minor bug that would report max speed of -621mph in movies that had no GPS data. 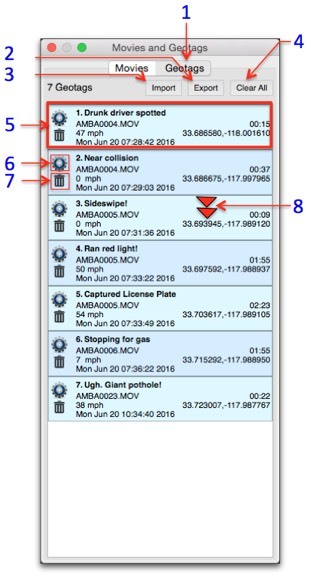 Dashcam Viewer v2.5.1 is a maintenance release with the following new features and bug fixes. Geotags are now included in the KML export feature. 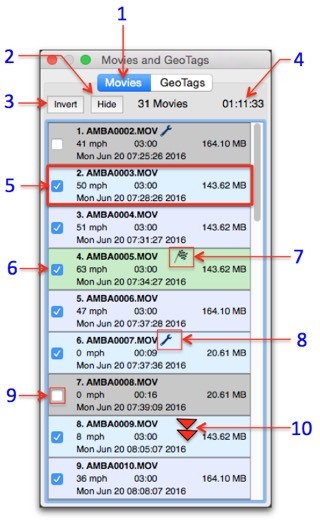 Improved post-processing of movies with bad GPS timestamps. Dashcam Viewer v2.5.0 was released today with the following new features. Dashcam Viewer is available for Mac OS X and Windows (64-bit and 32-bit). Download the free version from our website. in the Geotags Listwill jump to that point in the route. The geotags can be exported to a text file,and imported back in. 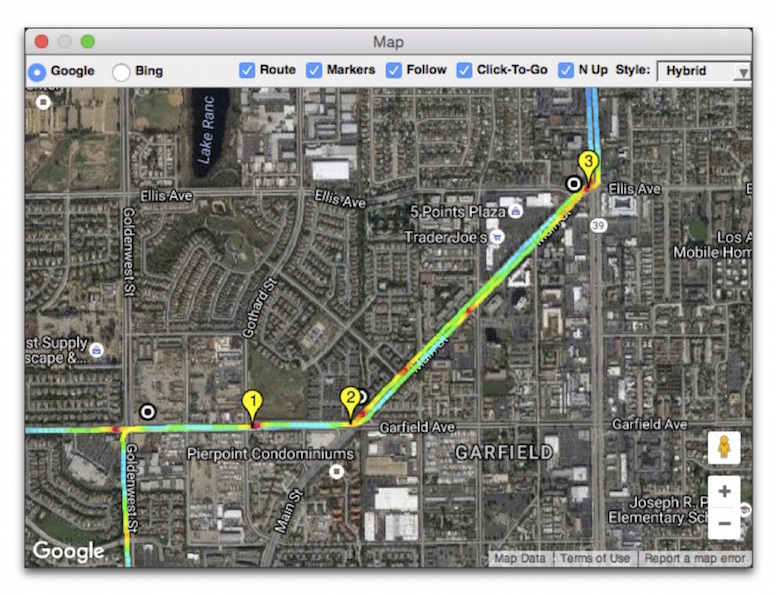 version supports up to ten geotags. Click this tag to toggle between the Movies and Geotags lists. Export the geotags to a tab-delimited file. If you plan to import these geotags back into Dashcam Viewer be sure to save the geotags file to the same directory as your dashcam movies. Click this button to load a geotag file back into Dashcam Viewer. Be sure to load your movies that are referenced by the geotag file first, then load the geotag file. If the geotag file references movies that are not loaded they will appear in the list with a gray background. The Clear All button will delete all geotags in the list. The geotag list item displays meta information about the event including title, movie filename, time in movie, vehicle speed, date/time, and latitude and longitude. You can edit the default title of a geotag by clicking the gear icon. Delete a geotag by clicking the trashcan icon. Double-click a geotag to jump to that point in the movie sequence. New Movies List. All loaded movies are shown in the Movies List. about each movie is displayed in the list item. Clicking the Hide button will remove the inactive movies from the list. Click it again to reveal the inactive movies. Invert will make the inactive movies active, and the active movies inactive. The information line shows the number of active movies and their total duration. Each item in the list shows the movie filename, movie duration, file size, file date, and maximum speed. Note that the file date is retrieved from the file system so if the file was modified in any way the date displayed here may not correspond to the actual date/time of the recording. The currently-playing movie has a green background. Double-click on any active (non-gray) movie to make it the currently-playing movie. The checkered flag is awarded to the movie with the fastest speeds. Sorry, no prizes are given. Clicking the checkbox off makes the movie inactive. Inactive movies are removed from the playback sequence and are shown with a gray background in the list. Their GPS data is also removed from the Map route and Graphs. Use this feature to remove uninteresting movies from the playback sequence. Click the checkbox on to make the movie active again. You can double-click an active movie item in the list to jump to it. If playback was previously on, the movie will start playing immediately. Added support for Viofo A119, firmware 2.0.